Remember how I was interested in trying a new fragrance after my Clinique Happy ran out? Well, my thoughtful husband chose one for me. How fun, right? It was a great Christmas present. With the help of a friendly salesman at Nordstrom, Bryce chose Eau d'hadrien by Annick Goutal. He paid close attention to my requirements - light, citrus-y, clean and for every day wear. 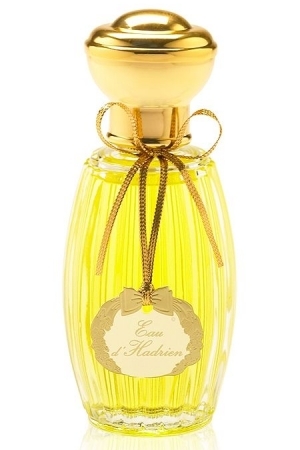 Eau d'hadrien is all those things. Compared to Happy it is more citrus-y with obvious lemon notes, not a hint of floral to be found. I look forward to putting it on everyday. Any perfume for you under the tree this year? I am a HUGE perfume fan. Not only do I buy lots of it (thanks to small and sample sizes on eBay), but I read about it a lot, too. Check our Chandler Burr (he was reviewing scents for the NYT and has written a couple of books about it) and Luca Turin (he and his wife, Tania Sanchez, review perfumes in a smart, funny way . . . I don't often share their tastes, but it is fun to read). I also like a site called basenotes dot net. I got Bulgari Jasmine Noir under the tree this year. A good winter scent: it's jasmine and tonka bean and mink coat. Mmmmm. I got Tokyo Milk Honey and the Moon in my stocking. Cozy and comforting! Believe it or not but I got a bottle of Happy and matching hand lotion! I got a bottle of CoCo Mademoiselle, one of my "signature" scents. A quick google search revealed this: "Top notes of Coco Mademoiselle Parfum incorporate Sicilian oranges, Calabrian bergamot and Sicilian grapefruit. A floral heart is created of pure rose extract and pure jasmine extract, along with a fruity touch of litchi, while its base notes carry a combination of Indonesian patchouli, Haitian vetiver, Bourbon vanilla ad white musk. This fragrance is dedicated to courageous, brave and modern women who prefer luxury and elegance."